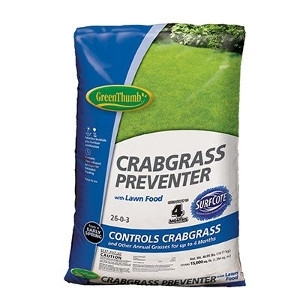 15M Green Thumb 26-0-3 Crabgrass Preventer Plus Lawn Food. Apply early, before crabgrass germinates. Easy to use. Controls Crabgrass and Other Annual Grasses. Contains 0.13% Dimension. 30% Controlled Release Nitrogen. Covers up to 15,000 square feet. Continuously feeds for up to 16 Weeks! © 2019 Barrett's Showplace Gardens. All rights reserved.